Lloyd Blankfein, president and chief executive officer of Goldman Sachs, took home nearly $54 million in compensation last year. The company's top five executives received a total of $242 million. The total amount given to nearly 600 executives would cover bailout costs for many of the 116 banks that have so far accepted tax dollars to boost their bottom lines. Rep. Barney Frank, chairman of the House Financial Services committee and a long-standing critic of executive largesse, said the bonuses tallied by the AP review amount to a bribe "to get them to do the jobs for which they are well paid in the first place. "Most of us sign on to do jobs and we do them best we can," said Frank, a Massachusetts Democrat. "We're told that some of the most highly paid people in executive positions are different. They need extra money to be motivated!" —The average paid to each of the banks' top executives was $2.6 million in salary, bonuses and benefits. —Lloyd Blankfein, president and chief executive officer of Goldman Sachs, took home nearly $54 million in compensation last year. The company's top five executives received a total of $242 million. 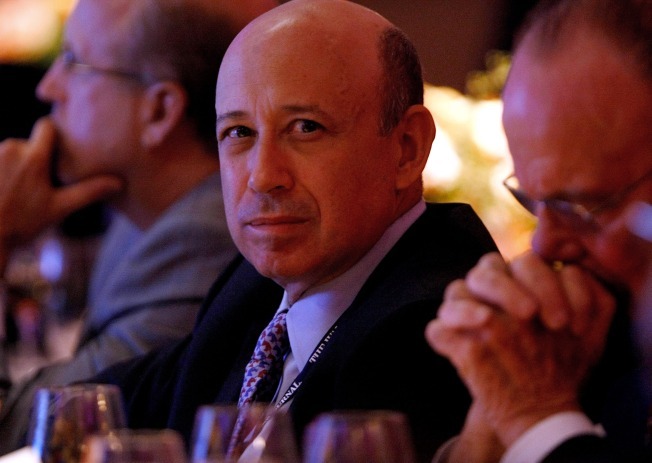 This year, Goldman will forgo cash and stock bonuses for its seven top-paid executives. They will work for their base salaries of $600,000, the company said. Facing increasing concern by its own shareholders on executive payments, the company described its pay plan last spring as essential to retain and motivate executives "whose efforts and judgments are vital to our continued success, by setting their compensation at appropriate and competitive levels." Goldman spokesman Ed Canaday declined to comment beyond that written report. The New York-based company on Dec. 16 reported its first quarterly loss since it went public in 1999. It received $10 billion in taxpayer money on Oct. 28. —Even where banks cut back on pay, some executives were left with seven- or eight-figure compensation that most people can only dream about. Richard D. Fairbank, the chairman of Capital One Financial Corp., took a $1 million hit in compensation after his company had a disappointing year, but still got $17 million in stock options. The McLean, Va.-based company received $3.56 billion in bailout money on Nov. 14. —John A. Thain, chief executive officer of Merrill Lynch, topped all corporate bank bosses with $83 million in earnings last year. Thain, a former chief operating officer for Goldman Sachs, took the reins of the company in December 2007, avoiding the blame for a year in which Merrill lost $7.8 billion. Since he began work late in the year, he earned $57,692 in salary, a $15 million signing bonus and an additional $68 million in stock options. Like Goldman, Merrill got $10 billion from taxpayers on Oct. 28. The AP review comes amid sharp questions about the banks' commitment to the goals of the Troubled Assets Relief Program (TARP), a law designed to buy bad mortgages and other troubled assets. Last month, the Bush administration changed the program's goals, instructing the Treasury Department to pump tax dollars directly into banks in a bid to prevent wholesale economic collapse. The program set restrictions on some executive compensation for participating banks, but did not limit salaries and bonuses unless they had the effect of encouraging excessive risk to the institution. Banks were barred from giving golden parachutes to departing executives and deducting some executive pay for tax purposes. Banks that got bailout funds also paid out millions for home security systems, private chauffeured cars, and club dues. Some banks even paid for financial advisers. Wells Fargo of San Francisco, which took $25 billion in taxpayer bailout money, gave its top executives up to $20,000 each to pay personal financial planners. At Bank of New York Mellon Corp., chief executive Robert P. Kelly's stipend for financial planning services came to $66,748, on top of his $975,000 salary and $7.5 million bonus. His car and driver cost $178,879. Kelly also received $846,000 in relocation expenses, including help selling his home in Pittsburgh and purchasing one in Manhattan, the company said. Goldman Sachs' tab for leased cars and drivers ran as high as $233,000 per executive. The firm told its shareholders this year that financial counseling and chauffeurs are important in giving executives more time to focus on their jobs. JPMorgan Chase chairman James Dimon ran up a $211,182 private jet travel tab last year when his family lived in Chicago and he was commuting to New York. The company got $25 billion in bailout funds. Banks cite security to justify personal use of company aircraft for some executives. But Rep. Brad Sherman, D-Calif., questioned that rationale, saying executives visit many locations more vulnerable than the nation's security-conscious commercial air terminals. Sherman, a member of the House Financial Services Committee, said pay excesses undermine development of good bank economic policies and promote an escalating pay spiral among competing financial institutions — something particularly hard to take when banks then ask for rescue money. He wants them to come before Congress, like the automakers did, and spell out their spending plans for bailout funds. "The tougher we are on the executives that come to Washington, the fewer will come for a bailout," he said.